Indulge in a Luxury Yacht for the day. 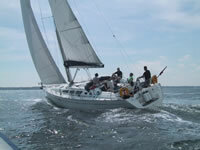 Our sailing experience is a day of pure enjoyment, whether you wish to entertain clients or reward staff. 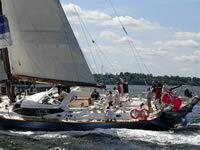 Our yachts comfortably host ten guests and are available for charter from 1st June to 30th September. If you have more than 10 guests we can provide additional yachts and organise a race at the end of the day, excellent for team building. Your day will commence at one of our coastal facilities, where refreshments and Danish pastries will be provided. 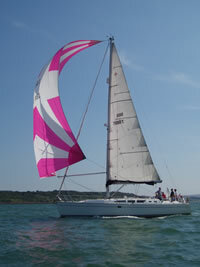 After a short safety briefing, guests will embark on a day of their choice, either a relaxing day enjoying the sights and coastline of the Isle of Wight or you can get involved in the full sailing experience with expert tuition. BOOK A TREASURE HUNT TO ADD TO YOUR YACHTING EXPERIENCE: It may be fun to incorporate our Treasure Hunt Event. Our sailing event is a truly memorable day to experience with all your guests having the chance to get involved. Each crew member is given a list of cryptic clues of items and places to find a photograph. A great idea for teambuilding, adding an element of competition to the day. Please call our sales department for prices. SAIL WITH AN OLYMPIAN: Join us at The Royal Lymington Yacht Club for a day of sailing with Olympic Gold Medallist yachtswoman Pippa Wilson on board a luxury 54’ yacht. Pippa has a fascinating story; she is modest about her own achievements but speaks engagingly about the importance of a team. Pippa will join you on the yacht and guide you through the day, furnishing you with some of her sailing knowledge. Please call our sales department for prices. Indulge in a Super Yacht for the day. This is really the ultimate VIP sailing day on board an Oyster 82’ Super Yacht, one of the very few based in the UK, making this a completely unique experience. The Super Yacht has a crew of five as well as the skipper and can accommodate up to 18 wannabe yachtsmen. This is a great opportunity to battle with the challenging British waters in the Solent, learn how to work with your crew and to sail this 82’ yacht smoothly to your destination. 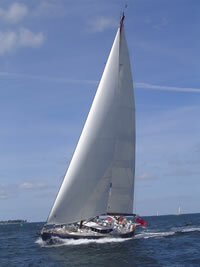 With the help of the fully trained crew you will hoist the sails, work the winches and helm the yacht. Lymington is the home port of the Yacht, although it is possible to embark at Ocean Village Southampton. Come aboard on arrival and meet the skipper, event manager and crew. Breakfast will be prepared by the chef and is served with tea, coffee and freshly squeezed orange juice. The timings of the day are entirely at your discretion, although guests will need to leave the yacht at 5 pm, to enable the crew to stay within regulations. The crew will make everybody feel at home – you are welcome to take part in the sailing or settle back and enjoy the cruise. Most of our guests have no sailing experience at all. The food we serve is a hallmark of our events. The chef will prepare everything on board the boat during the course of the day. Please let us know in advance if any guest has dietary requirements. Champagne, wine, beer and soft drinks are all complimentary and served throughout the day. The skipper will consult the guests to decide on the best cruising plan according to their wishes and prevailing wind and tide. Many clients chose to have a powerful rib accompany the Yacht. Those who make the transfer to the Rib are guaranteed an adrenalin high like no other! An excellent way of adding ‘spice’ to an already exhilarating day. We usually come off the water at 5pm and have a drinks reception in a waterside bistro or yacht club to provide a perfect venue to continue entertaining and to go on to have an evening meal or BBQ if desired.